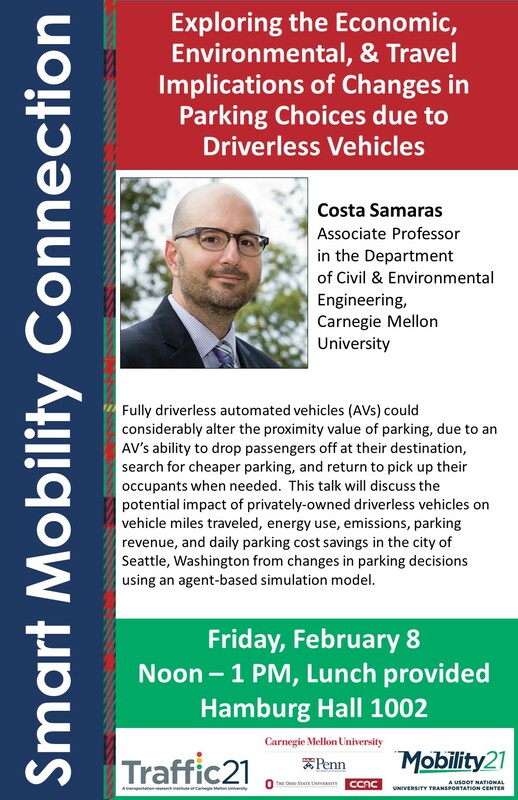 Today’s Smart Mobility Connection featured Costa Samaras, Associate Professor in the Department of Civil & Environmental Engineering at CMU. Costa highlighted his work with the economic, environmental and travel implications of changes in parking choices due to driverless vehicles. Costa’s study estimates the potential impact of privately-owned driverless vehicles on vehicle miles traveled, energy use, emissions, parking revenue, and daily parking cost savings in the city of Seattle, Washington from changes in parking decisions using an agent-based simulation model. Click here to watch the video recording of this SMC session.